With both of these teams on a losing streak, one run is sure to end when these sides clash in Belgrade. The hosts hold a 4-7 record at the moment while the side from Tel Aviv travels with a 5-6 record. These teams have played each other four times this Millennium and the Israeli side holds a 1-3 record. The Belgrade defence was a strong part of their early season form but in recent weeks it has crumbled. Crvena has allowed close to 92 points per game in their last three outings and a top priority for this Thursday night match is to tighten up at the back. Improving up front will also be a good idea for Crvena, although they do have some players who have been consistent for them. Marko Simonovic has offered an average of 12.6 points per game while Milko Bjelica has provided an average of 10.5 points per game, and Marko Guduric has chipped in with an average of 9.1 points per game. These are the players expected to lead the way for the hosts in Belgrade. Crvena may have been poor defensively of late but they still hold a record of allowing 77.1 points per game, which is better than the Maccabi record for the season. The Tel Aviv team has given up an average of 82.7 points per game so far this campaign and this is always going to place a team into trouble. Going forward, Maccabi have notched an average of 81.4 points per game, and Andrew Goudelock has been at the heart of this, with an average of 16.4 points per game. Sonny Weems, with an average of 13.7 points per game has also stepped up for Maccabi this season. 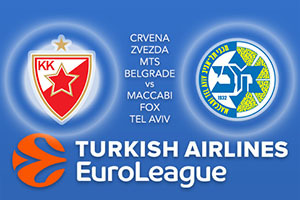 There’s not a lot between these sides in this Thursday night Euroleague game so take Maccabi FOX Tel Aviv at +2, which is provided at odds of 1.90. When it comes to basketball betting options, you always have the Over/Under market, go UNDER 155.5 at odds of 1.90. Bet Now!